We have a wooden cigar box and am wondering if anyone can tell us anything about it. The front says "Wilbur Wrights" across a picture of a cloud, the Wright Flyer and the Spirit of St Louis. It's marked on the bottom with "Factory No. 495 - 1st Dist., Ohio - 50" Also says "Claro." On the front it says, "Pilot," and there is a notice about the cigars being, "manufactured to retail for more than eight and not more than fifteen cents." This is the second one of these I've been asked about this week. Some perspective might be helpful. Between 1840 and 1960, more than 250,000 cigar factories were established in the United States, approximately half of them in NY and PA. They were found in every state and territory. The average life of a cigar factory was less than three years. The average number of employees was three and a half. Three people rolled between 500 and 800 cigars a day. Giant factories employing hundreds of workers capable of 50,000 cigars a day were in existence by the time of the Civil War. By 1890, cigar production was 6,000,000,000 a year in the US. Most brands were created by wholesale grocers and tobacconists. For pennies, it was possible for a drug store, barber shop, pool hall, or other establishment to have a "custom" brand of cigars, and nearly 2,000,000 custom brands were the result. A retailer could have any picture or brand name he/she wanted on a box. Many of these were manufactured in very small quantities. 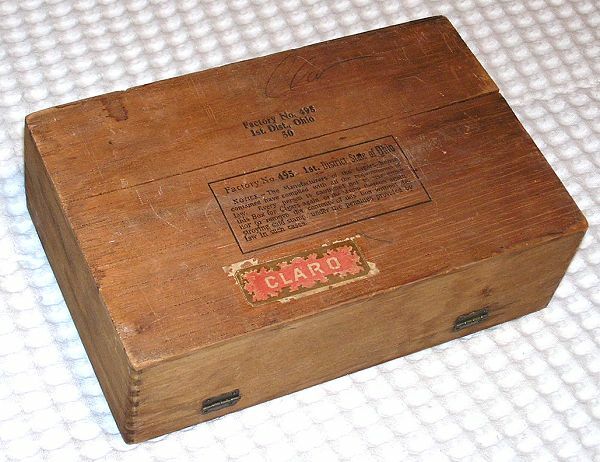 Your box is a common style called a boite nature, developed around 1900 and still in use today. Stylistically, they are not popular with collectors because, as RR once said about redwood trees, "if you seen one, you seen em all." 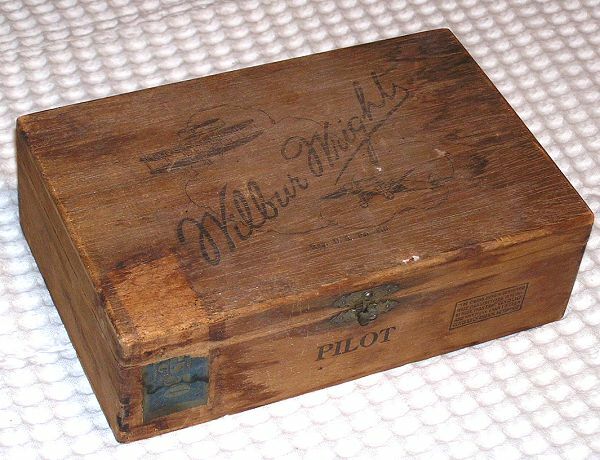 Your box appears to date from the late 1920's and held light colored cigars. A close look at the revenue stamp may be able to refine that, as it could be mid twenties. It was obviously named after Wilbur Wright. Naming boxes after famous and not so famous people was common. There are thousands of brands named after everyone from presidents of the US, military leaders, scientists, artists, sports figures, actors, etc. ...even a Columbia Univ chemistry professor has a brand of cigars named after him. Why not Wilbur? Rarely was permission obtained, though in some cases, like Henry George the economist, the cigars named after him were the actual brand and blend he smoked. That's rarely the case. These boxes are neither common nor rare. I've been asked about or offered about a dozen of them. Hope this helps.